Good bed very sturdy! Love it so much would recommend to everyone! The color is matches the one pictured! Set up was very easy took me about 20 minutes! Create a comfortable, contemporary bedroom with the upholstered Brentwood bed from Copper Grove. The sturdy wood frame is padded with polyurethane foam and upholstered with durable polyester for lasting style. 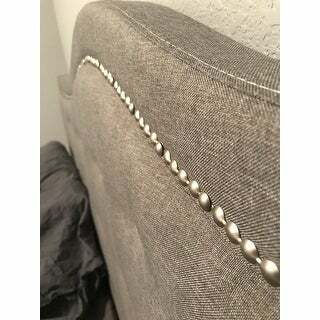 Classic button-tufting adds depth while shiny silver nail heads detail the curved headboard. This is a nice looking bed and it went together well. HOWEVER, I'm taking one star off because a key piece of information is missing in the specifications. The combination of our 9 in. foundation and 9 in. 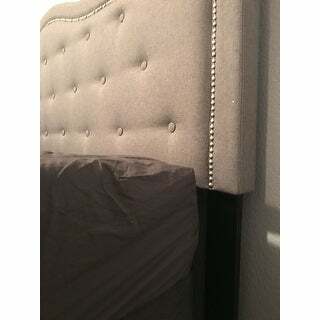 mattress will not allow the mattress to fit under the headboard, causing the mattress to overhang the foundation about 2 inches at the foot of the bed. If you look closely at the picture that Overstock provides, you will see how the mattress is not fitting under the headboard; the mattress overhang is hidden by the comforter. Had the specifications stated the 16 inches from slats to bottom of headboard, we would have been prepared for this complication. I won't be happy with just hiding the overhang with a comforter. This is going to cost me more money now, getting a new, lower profile foundation for this king bed. UPDATE: Even 16 inches for combined foundation and mattress makes it hard to change the sheets at the headboard; better to go with 15 inches total or a little less. The head board doesn't seem to be stuck on really well. I wish there was another piece of wood to support it in the middle section. I bought the king and we are a bit worried about "extra curricular activities" and how it will stand up. The bed itself is beautiful. I paired this with a 10inch foam mattress and a 5 inch box spring since reading reviews. Our mattress is right underneath the head board so I can still easily change our sheets but there isn't a large gap. So make sure that you don't go over 15 inches for combined mattress and box spring or it might not wedge under the head board, unless you want it above headboard which I believe I have a couple inches in front before the foot board. 2 stars becuz of price..... DO NOT buy as headboard is to low, after assembling and throwing mattress on it hangs 2 inches over box spring! BEWARE as this is NOT noted in description at all Now I must buy another box spring less than 9inch and hope it works..
Beautiful design. Cost x Quality ok. I kind of feel like this bed duped me. To be honest, it looks cheap in person. The upholstery is nice, but the decorative strip around the top is poorly put together. We also faced the issue of not being able to put the mattress under the headboard. Our mattress is now sticking out 2 inches over the boxspring. The frame is okay... the pictures make it look a lot nicer. Let’s see how long it holds up. We purchased this in Queen size. This headboard and base is very nicely manufactured and took me less than an hour to put together alone. It looks stunning in our spare room and the tufted fabric is quality. If I have any negative review, it would be on the flimsy crossboards, but that's an easy fix by using sturdier wood purchased at a hardware store at a minimal expense. I liked this so much that I'm thinking of purchasing it in King for our master bedroom! Great purchase! This bed was not too complicated to put together, took about 45 minutes for two people, and it is very sturdy. Headboard does not sit very high from base so I suggest a low profile box spring especially if you buy a thicker mattress. I bought this just days before Christmas, not expecting nor needing it to be here by Christmas. I was pleasantly surprised when it arrived before!!!! The bed itself is beautiful. It replaced an old, dark, 4 poster that we had for years. This is a nice quality bed and looks fantastic!! The nail head trim is such a nice touch. The only negative I do have....the instructions are not clear, and hardware, pieces are not labeled. It just takes a little extra time to look it all over and figure it out. This should not stop anyone from purchasing. 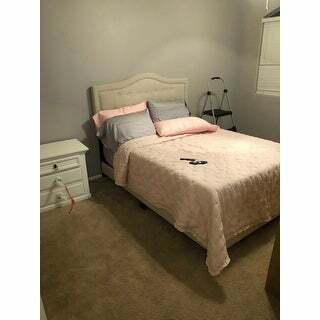 All in all, I'm very satisfied with the price, look, and quality of the bed. I would recommend!!!! Beautiful, sturdy, and easy to assemble. This bed arrived well-packaged in perfect condition. The assembly instructions were easy to understand and took under an hour for two adults to assemble. I have a deep pillow-top mattress, so I bought low-profile box springs and the height is perfect. The bed is a great price and looks high-end. I’m highly satisfied with this purchase. The bed is very pretty and was easy enough to put together, even by myself. 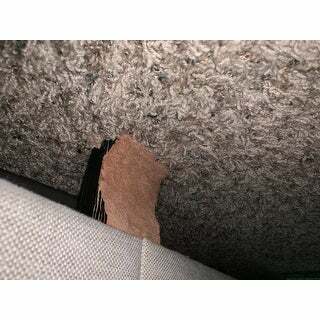 My only complaint is that the 4 slats to hold up the box spring are flimsy and one was not long enough. I will have to buy some type of wood to reinforce. Otherwise very nice and affordable ! This bed is gorgeous! We purchased it after another bed we’d picked out on another site arrived damaged. Overstock’s shipping was much faster and even though the box was a bit mangled, the bed was packed well and didn’t have a scratch. 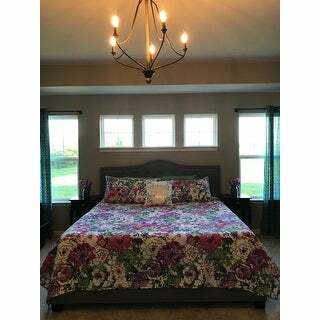 It looks great in our master bedroom. 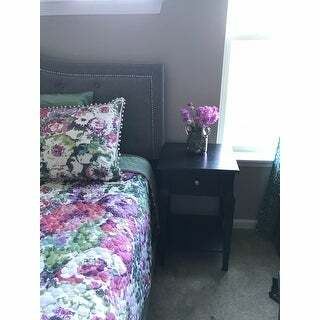 Chandelier and nightstands also from Overstock! Unfortunately, my husband and I only enjoyed this bed for 3 months before the structure support wood panels starting splintering and breaking. We are not heavy people and have only used it for 3 months in our new home. It's a nice upholstery and great color but the support frame cannot support us and our new mattress. The wood has broken 3 different places and we have been handy enough to repair ok our own but there is only so much you can fix with broken wood. the bed frame looks nice but is about 5” wider than my king sized mattress. Very disappointed that there is this awkward space between the bed frame and mattress. Also, the head board is very wobbly. It's lower than the picture alludes it to be but I really love it. I was even able to put it together all by myself! (It took me like 2 hours lol) but I'm also a 5'5 130 lb girl. The fabric doesn't have any snags or inconsistent stitches. It's a great buy for the price! This bed is beautiful. I love it! The only reason I gave it four stars instead of five is because it does not have enough of the support woods at the bottom, which supports the mattress, but that can easily be solved with a mattress box spring. Other than that, I would have given the bed five stars. I like the look, it is contemporary in its appearance. I do not like the artificial nail heads, its a continuous trim not individual nails. I do hope it last awhile since the slats are spaced so far away and on the thin side. Very nice and inexpensive bed, also putting it together was very easy. Love this bed, looks great in the bedroom and is very sturdy. It was quite easy to assemble. Color was exactly as shown on the website. Happy with this purchase. Unfortunately my daughters room is still a work in progress,but the bed is super nice. The headboard could be a little sturdier I suppose but we pushed it flush against the wall and it seems to feel a little more sturdy that way. Overall the bed was pretty easy to put together (a few adjustments of screws here and there evened things out) for the money, you won’t find a better bed. My daughter is 19 and absolutely loves it already. The frame is sturdy and beautiful. A great deal. I spilled my water in the middle of the night and placed a towel to soak it up in the morning the post had expanded and flaked off leaving me with a very big eye sore. I will try to replace the leg/post when I have the time to make the calls. Particle board...oh well. Still pleased with purchase. Beautiful bed frame! Not too hard to put together and really great price. Seriously looks like it would cost a fortune at some high end retailer. I would absolutely recommend buying this. "What sizes does it come in?" Please see the option tab for sizes. "Has anyone had any problems with off-gassing with this bed ? I put it together last night and this morning my guest room had an awful chemical smell." "Can you use an adjustable bed frame?" "What king of tools are required to assemble bed. How many pieces does it come in?" "We moved and lost the parts to put this together. Do we just need screws? What size?" "does this require a box spring i have a 14in mattress from my previou splatform bed"
"Will this upholstered bed and frame work with my existing adjustable bed?"